Viral RNA polymerase (PB1, PB2 and PA) transcribes one mRNA from each genome segment. Transcription is primed by cap snatching. mRNA are polyadenylated by the viral polymerase stuttering on a poly U track. MP and NS mRNA can be alternatively spliced, giving rise to mRNA coding for M2 and NEP proteins. PB1-F2 is translated by leaky scanning from the PB1 mRNA. Virus assembly and ESCRT-independent budding occurs at the plasma membrane. 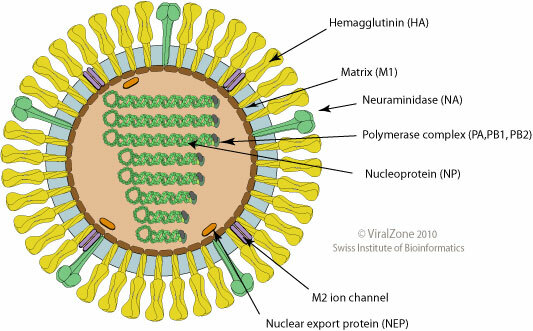 Influenza A virus inhibits the cascade leading to production of interferon-beta by targeting different cellular proteins. NS1 inhibits host RIG-I activation upon recognition of viral RNA, and subsequent induction of IFN-beta expression. PB1-F2 inhibits host MAVS activation. NS1 induces host gene expression shutoff by inducing host mRNA suppression through polyadenlyation inhibition. The viral mRNA are not affected because their polyA tail is generated by polymerase stuttering. It is generally accepted that human influenza viruses preferentially bind to host glycoproteins/glycolipids containing sialic acids in alpha 2,6 linkage, whereas avian influenza viruses bind to those containing sialic acids in alpha 2,3 linkage. Recent studies have shown that the Human traches and alvoeli epithelial cells are mainly expressing alpha 2,6 sialic acids, when only alveoli are expressing alpha 2,3 sialic acids PubMed. This could explain why avian viruses could succesfully infect humans only when breathed at high doses. Indeed the trachea and bronchioles are much easier to reach than the alveoli for aerial-transmitted virus.